...in any restaurant at home or abroad. Eat Everywhere unlocks an entire world of deliciousness, highlighting the craveable dishes for every cuisine. Whether you’re traveling, or trying immigrant restaurants near home, we’ll help you score from Argentinian to Japanese to Yemeni. This is your in-restaurant lifeline ... like a food-expert friend whispering in your ear. Eat Everywhere is the ultimate chowhound companion! Covering 75 cuisines (more coming)! You’re comfortable in Chinese or Mexican restaurants. Pad Thai and samosas feel like old friends. But you’re missing out on so many other delicious things! What if you had the know-how to explore and enjoy every kind of cooking — ALL the food? What if Ghanaian, Laotian, and Venezuelan restaurants (plus dozens more) felt just as familiar? Absolutely unmissable dishes; your best bets! 200,000 words, two years in the making by a team of 15 food-crazed devotees! We won’t overwhelm you with dull lists of 900 Thai curries (this is not a food encyclopedia). Just the unmissable items. 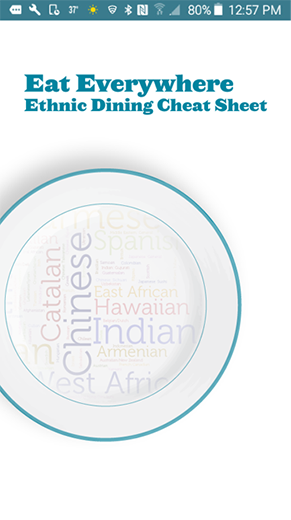 We help you choose, pronounce, and enjoy so you can eat like a local wherever you go! The world is LITERALLY your oyster! 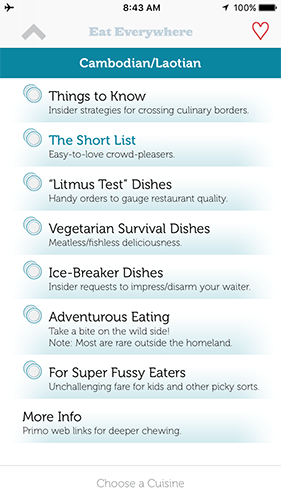 If you’re already an expert eater, Eat Everywhere will fill in gaps with fresh ordering strategies and clever pro tips. It’s the smart, portable cheatsheet you’ve always wanted! Eat Everywhere boils over with savvy, insider advice and good humor. So much chow-how has gone into this that we’re a bit horrified that you can simply have it — everything we know! — on your phone for five lousy bucks. The entire world of great eating at the tip of your fingers, wherever you go and whatever you crave ... the keys to the culinary kingdom! You can miss out on lots of great stuff ... or else you can Eat Everywhere!